Visit our taco shop at 1900 Folsom Street at The Wooden Nickel Bar, Mon - Sat (Closed Sundays), from 5pm-10pm - Corner of 15th St. Delivery available via UberEats & Amazon. $1 Shrimp Tacos, $2 Chicken Tacos. Every Tuesday night from 6-8pm. Delivery options available via UberEats and Amazon Prime! Keeping it classic with our favorite dishes from San Diego taco shops. Visit any of our markets for our season specials like ahi tuna fries, garlic potato rolled tacos, crispy lamb tacos, y mas! You can't have a fiesta without the tacos! You have the party? We have the food! Pick-up (at 1900 Folsom St.) catering options are available for events of all sizes and budgets. We had a ton of fun and loved driving around in our 70's taco truck at farmer's markets, festivals, and pop-ups! But, we are now focusing on our taco shop and will be putting all truck services on hold until we're ready! Pick-up and delivery is always available and we hope you'll continue to visit us at WN! From our San Diego hearts to your San Francisco stomachs. 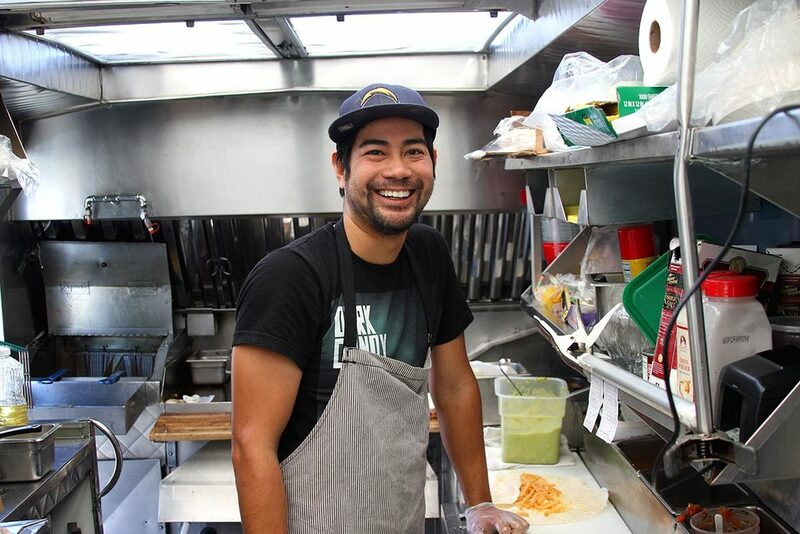 Originally from Chula Vista, owner Andrew Alcantara moved to San Francisco in 2011, and found that there were a lot of great taquerias in the Bay Area, but none that captured the unique and simple taco shop food he had grown up with back home. So he found his solution, to make it himself. Fritas Tacos was born. With recipes passed from our good friend's Abuelita we make everything we serve by hand. From hand rolling our tacos, to braising our meats for hours on end, we take pride in making simple, delicious food that's good enough for our family and yours. Follow us on Social Media for updates and news. Find us at our shop at 1900 Folsom St. For delivery, find us on UberEats and DoorDash! Our Carne Asada fries were featured in SF Weekly’s Treasure Island Music Festival recap. OishiiMoments Food Blog paid us a visit at 2015 Eat Real Festival. If you have any other questions we would love to hear from you.